The two letter domain, KR.com, has been sold to Chinese investor, Dai Yue. The letter combination “KR” represents Korea as an international country code. 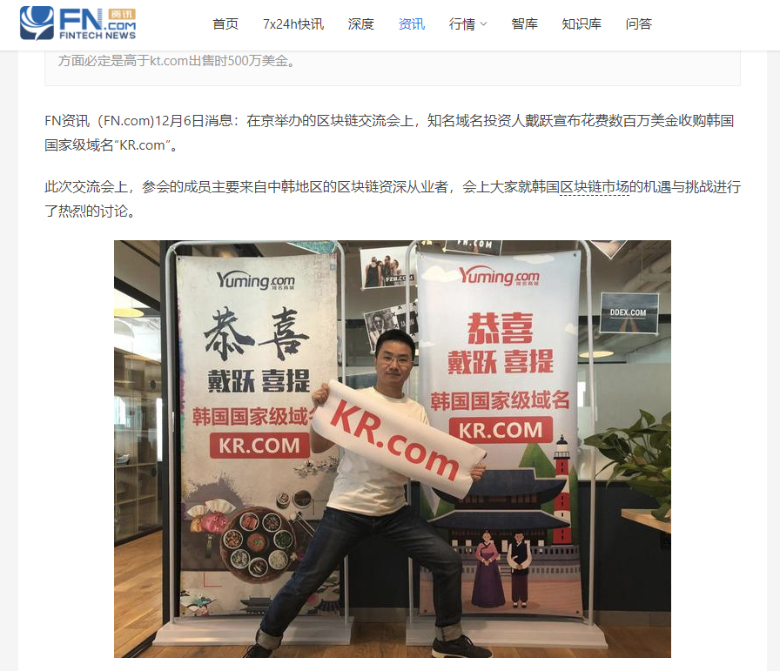 The price was in the millions of dollars, according to the buyer, who announced the acquisition of KR.com during a blockchain exchange meeting in Beijing, China. “In the Korean market, domain names are of great significance. Koreans have a strong sense of patriotism. During the economic crisis, Korean nationals launched a massive patriotic activity to help the government get rid of the crisis. The Korean nationals took out the gold in their hands to acquire the won to help the country survive the economic woes. The patriotism of Korean nationals is admirable. The Korean domain name with its own “national image” is highly accepted and purchased in South Korea. Korean local telecommunications companies spent $5 million in 2000 to acquire korea.com, a move that also created a national domain name. The highest record of purchases. Many thanks to Global Investment Consultant and Domain Broker, Cate Lim, for sharing the source of the news with us; she independently communicated with Dai Yue, who reputedly also acquired the domain JP.com earlier this year. The article, translated into English. Domain red alert : Would a nuclear war with North Korea affect domain investing?